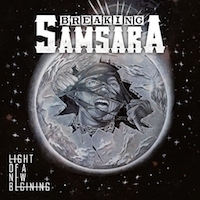 BREAKING SAMSARA was born in Germany in 2010 and quickly followed with a self-titled debut release in 2011. This album is thought as a more Classic Rock endeavor. Now, after a break from recording to address line-up changes, style findings and slews of performances, the band is back with their sophomore effort “Light Of A New Beginning”, thought to be much more Progressive than its predecessor. This album comes in with eight tracks and a listening time of just under 40 minutes. Track one, “Restless Nights”, opens with an overwhelming sense of Classic Rock. While this album may be more Progressive overall, this track drips with classic riffs and vocals, with that pumped up drum. It does have a bit of a thicker bass, but the keys solidified my initial thought of a very Classic Rock track. “Rebel At Heart”, track two, was a little more Punk-ish with those Classic Rock roots. Track three and name sake of the album is a bit more Modern Progressive Rock than those before it. However, you can still feel at the very core of the track that the influence is Classic. The vocals here sometimes sound like Steven Tyler, with their own twist and never as high pitched. The guitars in this track are fantastic and the bass has some impressive bits in this one as well. I can see where this one would be the names sake. It is one of the best. “Time For Things To Change”, track six, is the ballad of the album, but it’s not one of love. Well, yes, it is kind of; but mostly it’s about changing oneself for a better relationship with a person who invoked the need for change…because of love. This track is a bit heavier than most ballads, but fits nicely into this album as its ballad track. It’s a good one. The final track, “Scarsoul”, comes in a bit darker, but picks up at about 25 seconds in. The guitars are a highpoint in this track as are the vocals. They don’t feel too overdone, and balances nicely with the guitar. The keys and drums help keep the sound lightened a bit, even with its quicker pace. BREAKING SAMSARA is a badass name. Samsara means the cycle of death and rebirth to which life in the material world is bound. Obviously, breaking samsara is stopping this cycle. Pretty incredible name, but the name hyped me up for what I thought was going to be a total Progressive Rockdom and I got Classic Rockdom. Fundamentally, there is nothing wrong with “Light Of A New Beginning”. There are incredible riffs and solos abounded and some interesting leads. I was just underwhelmed over all. It’s not bad and has some originality, but overall, it’s been heard before.